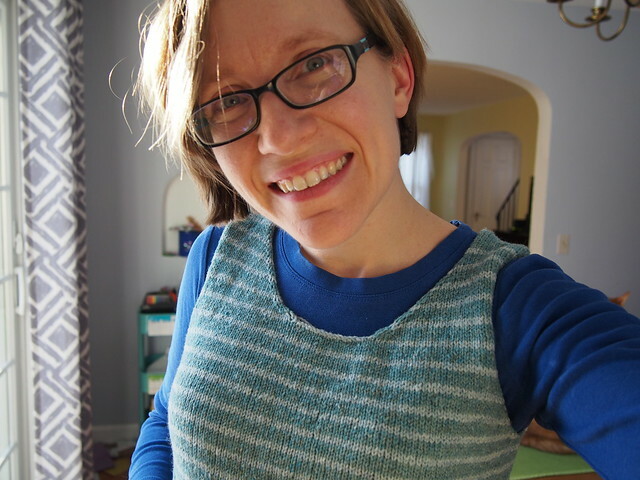 It’s funny – as soon as I posted yesterday, about the conversations regarding racism in the knitting community and grappling with the username I’d had since 2002, it seemed really obvious to me that what I wanted and needed to do was change it. So I did. You can now find me on Ravelry and Instagram as “stringsaremything”. I picked that name because strings truly are my thing – seriously, between knitting and crochet and embroidery, and then violin and ukulele, and heck, even language can be thought of in terms of strings (especially if you’re a former computational linguist like me)…there’s a lot of stringtastic goodness in my life! On Twitter, I had to go with something a little different, because they have a character limit for usernames. So I went with “saiteliebe”, which is basically “string love” in German; “saite”, though, very specifically refers to strings in a musical context, so I lose some of the scope of my string love, but I keep the German-language connection there, so I think it works. It will probably take me awhile to get used to these new usernames; it’s a little sad to let the old one go, because it had been mine for 17 years, but it felt like the right thing to do. I think that my old username is probably lurking in a bunch of other less-used sites, too, but I’ll deal with those another day. The big one that I’ve left unchanged for now is Flickr, because I cannot for the life of me figure out what happens to my linked photos if I change my username there; on Ravelry, the change was seamless, and links with my old username simply redirect to the same page under the new username, while on Instagram, it was seamless within the app, but links from outside with the old username no longer work. That wasn’t a big deal for me, because I don’t link to stuff from Instagram. But Flickr? The entire lifetime of my blog’s photos are linked from there, so if I break that, I create a nightmare for myself here. So that’s not changing until I figure out how to do it without breaking everything. Anyway, along with those updates, I thought I’d share a little update on the stripey sweater that desperately needs a better name. 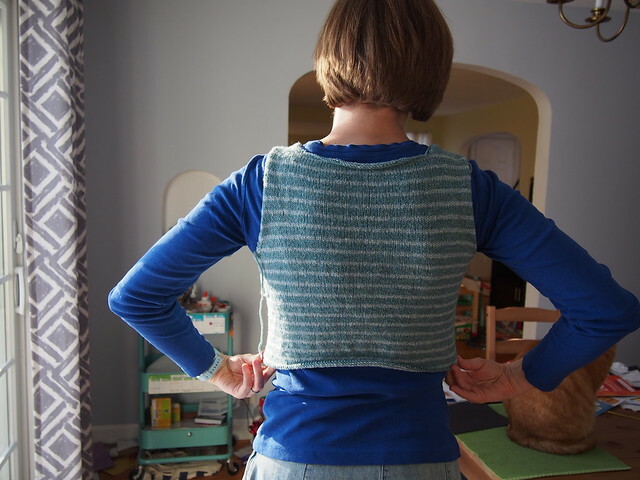 A row here, a row there, while my students do in-class writing and at night before bed, means that I’ve now reached the point on the sweater where I’m going to be adding some light A-line shaping. I’m putting the increases 12 stitches out from either side of that purled stitch “seam”, which I’m hoping will create the look that I want. We’ll find out! 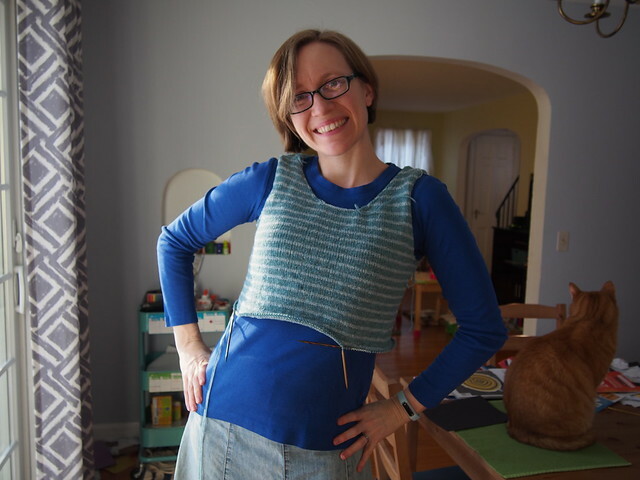 I still need to decide exactly where I want to start the pockets; I know I want the sweater to hit at the hip, and that I’m planning to split it above the bottom hem so that I can make the back a bit longer than the front, and I want the bottom of the pockets to rest right above the bottom hem on the front. 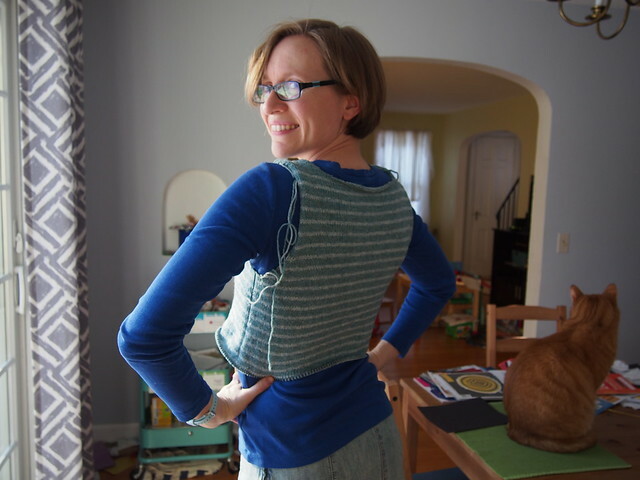 I think there are still quite a few more inches to go before I start them, but I’m going to keep trying it on as I go so that I place them exactly where I want. That’s the best thing about knitting from the top down! So far, I’ve used a little over 1 ball of the darker blue, and significantly less than a ball of the lighter blue. I started out with 4 balls of each color, so I’m thinking I’ll probably end up with some leftovers. I love knitting with this De Rerum Natura Ulysse yarn, so I’m sure I’ll find something to do with the extras if I have them – maybe a Gliondar hat if I’ve got enough?